TurquoiseJewelry.com unleashes the best summer tips to keep jewelry pristine. It’s no secret that people treat themselves in the summertime. The trouble is that they often neglect to treat their jewelry the same way. It’s no secret that people treat themselves in the summertime. 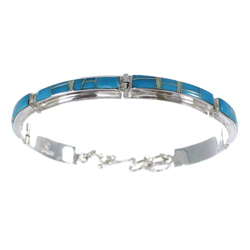 “The trouble is that they often neglect to treat their jewelry the same,” says TurquoiseJewelry.com spokesman, Jack Burch. The team at TurquoiseJewelry.com knows that taking care of jewelry is primarily preventative work and they know how easily jewelry can be damaged in the summertime when people are trying to have fun. That’s why Burch and the team at TurquoiseJewelry.com have put together a list of simple tips that can help people keep their jewelry shinning in the summer sun. Summer is typically a time for swimming, cooling off. However, chlorine or salt water is the easiest way to damage any stone. Make sure to remove all jewelry before taking a dip. Both elements work to erode most gemstones and precious metals like silver. Another destructive summer habit for jewelry is using sunscreen and other lotions, applying it over the jewelry for convenience. These products will make jewelry look dull over time and only expensive jewelry cleaning products will get it back to its former glory. Maintenance is another simple way to keep jewelry looking great through the summer. Something as simple as buying a jewelry cleaning cloth once a week can really go a long way. Storage is another important factor to consider. Choosing a clean, dry place to store jewelry will keep its shine and takes no time from a person's fun summer schedule as well. Storage in the proper climate is good, but the most effective method is keeping jewelry in a fabric-lined jewelry case. The soft lining of these bags or jewelry boxes will work to prevent scratches when people are in a hurry for fun summer events. Once in a blue moon, people should take their jewelry into a professional. After the summer season, take it to a reputable jeweler for a professionally cleaning to maintain the luster and sparkle of precious jewelry. People can find a trustworthy jewelry store in their area. TurquoiseJewelry.com invites anyone to check out their amazing summer selection and use the tips the have provided to keep their collection looking great all summer long.